We’d love your help. Let us know what’s wrong with this preview of The Friendship Lie by Rebecca Donnelly. Description: Cora Davis's life is garbage. Literally. Her professor parents study what happens to trash after it gets thrown away, and Cora knows exactly how it feels--to be thrown away. Between her mom and dad separating and a fallout with her best friend, fifth grade for Cora has been a year of feeling like being tossed into the dumpster. But Cora has learned a couple of Description: Cora Davis's life is garbage. Literally. Her professor parents study what happens to trash after it gets thrown away, and Cora knows exactly how it feels--to be thrown away. Between her mom and dad separating and a fallout with her best friend, fifth grade for Cora has been a year of feeling like being tossed into the dumpster. But Cora has learned a couple of things from her parents' trash-tracking studies: Things don't always go where they're supposed to, and sometimes the things you thought you got rid of come back. And occasionally, one person's trash is another's treasure, which Cora and Sybella learn when they come across a diary detailing best-friendship problems. Told in two intertwining points of view, comes a warm, wry story of friendship, growing up, and being true to yourself. 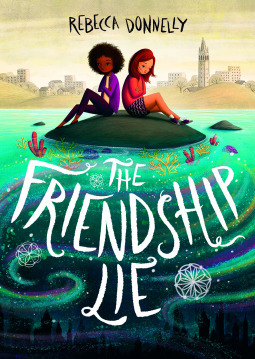 Written by Rebecca Donnelly, author of How to Stage a Catastrophe (an Indies Introduce and Indie Next List honoree), The Friendship Lie will speak to any reader who has struggled with what to hold on to and what to throw away. To ask other readers questions about The Friendship Lie, please sign up. Middle grade readers should enjoy and identify with this interesting friendship drama. Cora and Kyle are twins entering fifth grade. They have been best friends with Sybella since second grade. The three have invented an elaborate fantasy game together they call Aquafaba. For the first time ever, the friendship between Cora and Sybella is threatened. Feeling Middle grade readers should enjoy and identify with this interesting friendship drama. Feelings are hurt, and misunderstandings occur as lies are spread. It seems the new girl Marnie is determined to come between the two girls at any cost. Perhaps because Cora is undergoing challenges at home, she is extra sensitive to perceived slights from her friend, and unable to communicate her feelings. Will their friendship withstand these challenges? Cora has been upset over changes at home...her parents have separated, and her mother is working in Belgium for a year. Cora feels this loss deeply, and needs her friend more than ever. She is facing the loss of both Sybella and her mother in this fiasco her fifth grade life has become. The twins’ parents work in environmental science specializing in garbology at UC Berkeley. Their home lives reflect their parents’ dedication to reducing waste. Cora understands the future of the planet is at stake, yet her life seems to revolve around the handling of garbage. Is it any wonder she can’t help feeling as if she has been discarded like...well, a piece of garbage? I enjoyed this book a lot more than I thought I would. I also loved how open the book was, how relevant it is in today's world. Cora was such an amazing character for me, one that I saw a lot of myself in when I was that age. She was scared and angry and sad and happy and just this big rollercoaster of emotions that I guarantee many kids and adults will relate to. I know I would have related just as much, if not a whole lot more, when I was a kid. The book itself is great in looking at friendshi I enjoyed this book a lot more than I thought I would. I also loved how open the book was, how relevant it is in today's world. The book itself is great in looking at friendship, love and family. It's also a great book in looking at the environmental impact our waste has, and I gotta say, I did actually learn some things about recycling and waste myself and I did think I was pretty environmentally concious. If I had one criticism of this book, it's that it felt a little jumbled up. The book switches to different parts in the story as you go forward which it does do a pretty good job of as I felt you learned more of the characters then you figured out the whole story, but in some places it felt out of place when starting a new chapter. Moving on I just wanted to say how greatful I was for Rebecca Donnelly for her incorporation of representation that was never questioned or made to feel out of place, it was just treated like a normal thing, which it should be. Cora's best friend, has one white and one black parent, who as a family unfortunately, as Cora tells us, sometimes get stared at as being different. Another moment I loved was Dani being LGBTQI and having a girlfriend, which is only mentioned once, which is great as it wasn't considered her defining characteristic and again I just have to say how much I love that it wasn't considered such a big deal. Cora and Kyle's parents are also divorcing which you do see how Cora is feeling about it and I think it is great for children to be exposed to those situations and see how someone else goes throu it. If you are a teacher or librarian or parent or teen or kid, do yourself a favour and pick up this book. It had so much in it that you dont see often enough in middle grade. It has so many lessons to teach and can start so many conversations. In all the middle grade books I've read, this is easily in my top 5. It was so easy to read, it kept you turning the page and I guarantee anyone and everyone can learn something from this book, big or small. I had the opportunity to read a NetGalley digital ARC of this middle grade novel in exchange for a review. Middle grade readers will definitely be able to relate to the ups and downs of friendship at this sensitive age. At this age, kids can be friends one minute and enemies the next, and usually the rift in the friendship is over a misunderstanding. Once the relationship suffers this kind of blow, it can be really hard for both former friends to extend themselves and/or apologize for what happe I had the opportunity to read a NetGalley digital ARC of this middle grade novel in exchange for a review. Middle grade readers will definitely be able to relate to the ups and downs of friendship at this sensitive age. At this age, kids can be friends one minute and enemies the next, and usually the rift in the friendship is over a misunderstanding. Once the relationship suffers this kind of blow, it can be really hard for both former friends to extend themselves and/or apologize for what happened. Cora and Sybella have been best friends since second grade when Sybella was a new student and Cora brought her into the imaginary world she inhabited with her twin brother, Kyle. Through the years, the three were inseparable. But when they entered fifth grade and were assigned to separate classrooms, they also started to pursue separate interests and there were strains placed on the friendship by Marnie, new to the school. Add to that Cora’s unhappiness over her parents’ divorce and her mom’s yearlong job in Belgium, and a simple mistake blows up into a huge chasm in her friendship with Sybella. This friendship drama is set against the backdrop of Cora’s father’s work as a garbologist at the University of California. The family’s efforts to use less, recycle more, and keep trash to a minimum along with Cora’s participation on the Trash Team at school could definitely inspire kids to hold their own “Trashlympics” and “Capture the Trash” events in their own communities. At the least it might help kids think about how to minimize their own impact on the environment. This book comes out in August and would be a good realistic fiction book to have on the shelf. It would be good for readers who enjoy relationship drama, particularly for those in grades five and up. Thank you to NetGalley & Capstone for providing me with an ARC in exchange for an honest review. I loved this book so much. The characters were so loveable and the plot was amazing. Even though this is a middle grade book, it thought really important lessons in such a nice way. The main topic of the book might be friendship but it talked (even if not in depth) about divorce and how hard it can be for a kid to deal with it. I loved the narrative so much, it was so nice to read and it thought Thank you to NetGalley & Capstone for providing me with an ARC in exchange for an honest review. I loved this book so much. The characters were so loveable and the plot was amazing. Even though this is a middle grade book, it thought really important lessons in such a nice way. The main topic of the book might be friendship but it talked (even if not in depth) about divorce and how hard it can be for a kid to deal with it. I loved the narrative so much, it was so nice to read and it thought really important lessons. It’s really nice, also, that we got to see the story of the argument from both Sybella and Cora’s point and it was fun to try and connect the dots about what happened. I also adored how the diary ties everything together and the parallels were really nice to see as well! This is certainly a must-read for MG readers. Cora’s dad is a Garbologist at the Univeristy of California and her whole family tries to use less and recycle more to reduce waste. She struggles to come to grips with a lot of changes in her world including starting 5th grade, divorce, and a big fight with a friend. At this age (9-10) it’s hard to navigate fights with friends and how to make up or move on, and this book handles it all really well. Readers bounce from the time before the fight to the time after the fight back and forth so the reader doesn’t really know what happened in the fight till the end. I remember my first fight with best friend at that age, and this book does a good job exploring how Cora deals with all those feelings and helps young readers find their place and role in the world. I enjoyed the garbage metaphor throughout this book. The way the narrative cuts back and forth between the past and the present was flawlessly executed, and the characters of Cora, Kyle, and Sybella were three-dimensional and relatable. Not my favorite book, but I think kids will certainly enjoy it! This is the perfect book for my students! Every year, I have friends who get into some kind of disagreement with each other. This is the perfect book to hand them!! I'm going to need several copies so I always have one ready to hand out! I absolutely loved this! Full review to come closer to release day! A wonderful middle grade about the struggle of a friends first fight, but it deals with so much more in such a small amount of space. Cora is such a relatable character who is going through so many changes (starting 5th grade, divorce, new friends, growing up). The author tells us the story going back and forth from before the fight and after and we don’t really know what went wrong until the end, which I would have thought would be annoying but she does it well. It’s hard for kids at that age A wonderful middle grade about the struggle of a friends first fight, but it deals with so much more in such a small amount of space. Cora is such a relatable character who is going through so many changes (starting 5th grade, divorce, new friends, growing up). The author tells us the story going back and forth from before the fight and after and we don’t really know what went wrong until the end, which I would have thought would be annoying but she does it well. It’s hard for kids at that age to come to terms and actually say sorry to one another so I loved that aspect of reality.